All The Pretty Dresses: A dress for another one of the Not Snow events! An original circa 1890 lady's rich silvery grey green silk brocade Winter weight robe in a beautiful begonia leaf motif. Trimmed with faux seal skin silk plush and lined in a heavy red canton flannel. Labeled " J. GILLES & CIE, Robes et Confections, 17 Avenue de l"Opera, PARIS." A blind front self fabric button closure, a gathered and pleated tail, and a turned hem.15" from shoulder to shoulder, a 34" bust, 27" waist and 52" from shoulder to front hem. In clean as found condition,The robe appears to have had a silk lining, with evidence found, and the red flannel lining has basic basting that was not meant to be seen. 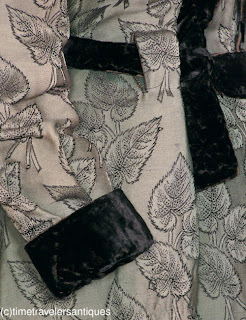 Wear to the button holes, a missing hook and eye at the throat, some wear to the silk plush, along with some small age flaws, mostly small pulls, and some very slight color variation in the folds that must be looked for. 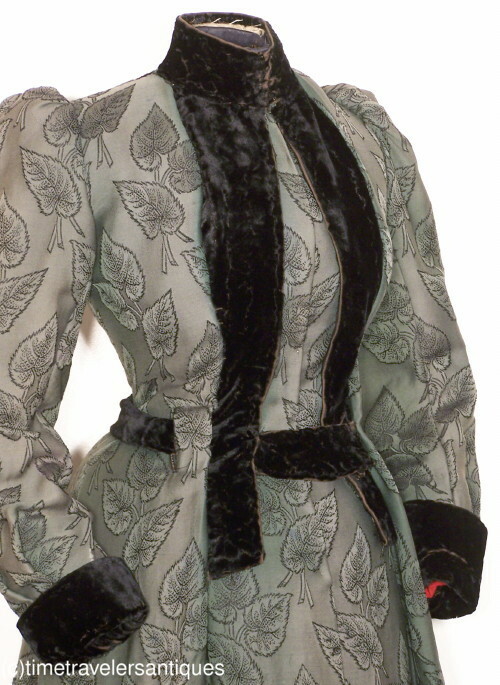 A fine French Victorian era Winter weight house dress. I think this is later than 1890. To me, it looks very Turn of the Century - 1898-1902. As for the not snow - here in the Mid Atlantic of the United States, our evil weather men have conspired to call for snow not once, but twice this winter with...rain. Gah!